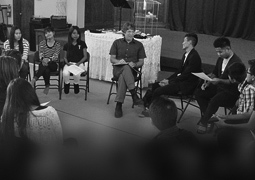 The Anabaptist Learning Workshop is a program of lifelong learning - at the intersection of Christian faith and contemporary life for laypeople, church leaders, pastors, seekers, new Canadians, and others. 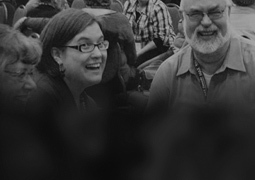 The Anabaptist Learning Workshop is a program of exploration inside and outside the classroom. Much more than a “Morning Spent with the Saint John’s Bible”! For the past almost twelve months I’ve seen postings around the University of Waterloo campus for events related to the St. John’s Illuminated Bible. However, all it raised for me was a mild curiosity, quickly discarded as I equated the word “illuminated” with gaudy sea front Illuminations, coupled with the thought as to why another version of the Bible was necessary. Flip forward ten months to a lunch time conversation at Grebel with a Masters of Theological Studies student who had recently visited St. Jeromes for a guided tour of the St John’s Bible, and had been surprised and inspired by what he had learned. In a moment of “educate yourself” self-talk, I headed off to sign up for the ALW “A Morning with the St John’s Bible” workshop. As the workshop date drew closer and my weekend became busier, I began checking for the number of registrants – did I really want to attend? Wouldn’t someone who really wanted to go like my spot? I already had a function on Sunday afternoon, excuses galore, but there was still plenty of space, so on Saturday October 28th I found myself walking in to the Sunday School room of WK United Mennonite. As one finds often in life, this was an occasion not highly anticipated which becomes quite transformational. My initial dismissals were quickly quashed - the word “illuminations” referred to the multi-dimensional illustrations created by a team of artists and “St John’s” referred to the Benedictine Monastery that helped fund and manage the project. Then came the history of the project – the dream of a calligrapher to re-produce the text of the Bible, in a unique calligraphy font, on calf skin, with illustrations that would be relevant to the 21st century, a project more than 20 years in the making. It would be a dis-service to the creators of this project to try to begin to describe their work. I can only be grateful that I was able to spend three hours learning about the project and viewing the heritage version of the St. Johns Bible containing the Gospels and Acts of the Apostles, which was present. The illustrations evoked a sense of worship and awe, the images reminds one that the Bible text is relevant to-day. I am thankful that there are people who have the passion and determination to see a unique project through, and as such generated renewed appreciation of the creativity in others. I was reminded that God’s word inspires moments of worship if we just take time to stop and reflect, and the imagery has remained with me during times of personal or corporate worship. While we were instructed to wash our hands if we wanted to touch the pages, I would suggest you stand far enough back not to let tears blot the pages. For those of you who want to learn something new, keep an eye on the upcoming ALW workshops…you never know what you might discover.